Whoever came up with red-eye gravy was either very hungry or very hungover, maybe both. Afterall, coffee and salty pork fat don't exactly seem like a winning combination. But red-eye gravy is simple, it's Southern as cornbread (y'all), and more than anything, it's salty as hell. Dietary guidelines be damned, some morning you just need an extra punch of salt - even if it's mixed with coffee and ladled over grits. Red-eye gravy is basically two ingredients: salt-cured country ham and coffee. On it's own, it's rough. Think Vegemite via Montgomery, Ala. Just as Vegemite works better on buttered toast (I'm told), red-eye gravy is made to dress grits. I love grits, but there's no getting around how bland they are. Add a good bit of butter, salt, pepper, cheese, even barbecued shrimp, and you transform the grainy porridge into a pretty nice dish. A little red-eye gravy does the trick, too. The bitterness of the coffee works with the salt and cooked pork flavors from the country ham. A little butter adds a needed bit of richness to the gravy. To make it, simply fry up a couple slices of country ham, deglaze the pan with black coffee and whisk in some butter. Now, the other night I was watching Diners, Drive-Ins and Dives (I have no excuse for myself) as Guy Fieri tasted some Arizona cook's red-eye gravy. It was made with chicken stock and involved no ham or coffee. I don't know what they were doing, but they weren't making red-eye gravy. It's one thing to play with a recipe, but once you remove the primary ingredients it becomes a different dish. And then I reminded myself I was watching Guy Fieri. Red-eye gravy is a very quick dish. If you're going to make it as part of a large breakfast (and you should), cook the ham first (about 3 minutes per side) and deglaze the pan with 1 to 2 cups of coffee (to taste), making sure to scrap up the stuck on pork bits. Whisk in 2 tablespoons of unsalted butter (or more to taste). The gravy doesn't reduce (please, don't reduce it), but it can be kept warm while you prepare the grits, eggs and whatever else you plan to have. Once everything it ready, simply ladle on the red-eye gravy (y'all). With the weather this past Sunday only threatening rain instead of actually pouring as predicted, Eliza and I trekked into the city to run a few errands, and maybe grab some food and drink. After a long due stop at Second Story Books (who are having a 20% off Summer Sale, FYI), where we failed to come back with fewer books than we had brought, we swung by Circa to check out the brunch selection. Established in April 2007, Circa is a relative newcomer to the already crowded category of "Dupont Circle Upscale Cafes." Apparently they have carved themselves a niche, as the shiny, aluminum accented dining room was at capacity; unexpectedly, we were able to snag the last two top on the makeshift sidewalk patio. If nothing else, Circa is a great spot for people watching — over the course of our meal, we saw dogs and babies of every size, several death-defying feats of cycling, and were regaled with a fascinating, hour long argument from a neighboring table over a very special chair, and why Diner #1 felt it was wrong of Diner #2 to get hammered and ruin it. (To our dismay, the two gentlemen departed before reaching consensus). The food was decidedly less thrilling. Eliza's Caesar's Salad, which on the menu promised "roasted red peppers, boiled eggs, [and] Spanish anchovies," actually contained about a square inch of pepper, one-half-of-one egg, and not a single tiny fish; I don't know where they get off pluralizing! My hamburger Sliders were equally disappointing, as the onions were not remotely carmelized, and each burger was presented on a bun that was limp and quite clearly store bought. Our meals as served weren't bad for the price ($7 and $9.75, respectively), but neither was actually what we ordered — a bit more attention to detail and truth in advertising might well be in order. After a detour to U Street for some Margaritas at Alero (who knew half a pitcher was so big! 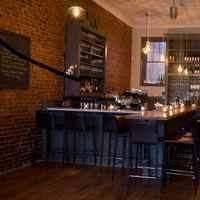 ), we happily made our way down 14th Street to our next port of call, Cork Wine Bar. Situated in the evolving Logan Circle neighborhood, Cork and its neighbors are an eclectic bunch whose numbers include a furniture store, a bodega, a dog sitter's, a plant shop, an independent comic book shop, and other small businesses not common to the city. Cork reflects its diverse environment with one of the most interesting wine lists I have ever seen. It is an unfortunate fact that most restaurants in this area, even those which purport a wine focus, are lazy when it comes to their by-the-glass programs, limiting their selections to the banal offerings of the larger distributors (which are all to willing to "help out" in putting them together). Even those that put the effort forth all too often will take the safe route, sticking to well-known, workaday producers and varietals. Not so at Cork, whose 40+ long list is dominated by relatively obscure French and Italian wines like Verdicchio, Irouleguy, and Marcillac; if these words are meaningless to you, fear not, as each wine is accompanied by a pithy, well-worded description. Our server was very attentive and helpful, and over the course of the afternoon we were visited by several staff members, each friendly and informative. Prices range from $6 to $14 a glass, and I promise there is not a boring wine among them. For those interested in training their palates, Cork offers several well priced flights which are changed on a monthly basis. As wine is always best enjoyed with food, Cork serves a selection of small plates intended for sharing and sampling with the bar's many wines. The menu is comprehensive given its size, offering cuisine appropriate for nearly any glass. On Sunday, we enjoyed a dish of sauteed wild mushrooms in madeira and marjoram, an asparagus special, and several items off the charcuterie and cheese list; everything was well prepared and well priced (the mushrooms were particularly tasty, and I hope someday we can replicate them at home). Where Circa seemed careless in its execution, the people behind Cork quite obviously have a vision, and everything seems very well in focus. Though I have only been once and, therefore, am loath to make any conclusive judgments, I can say that I will most certainly be visiting Cork again. If you have any interest in exploring the wider world of wine, at first blush Cork seems a great place to begin.